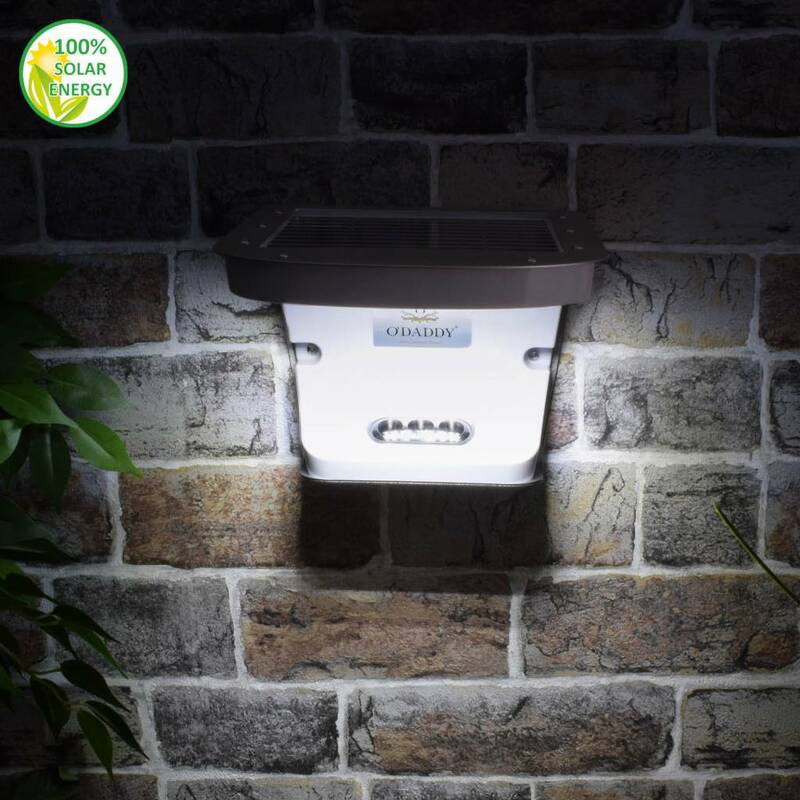 The Galaxy is a great solar light with a gorgeous aluminum design. 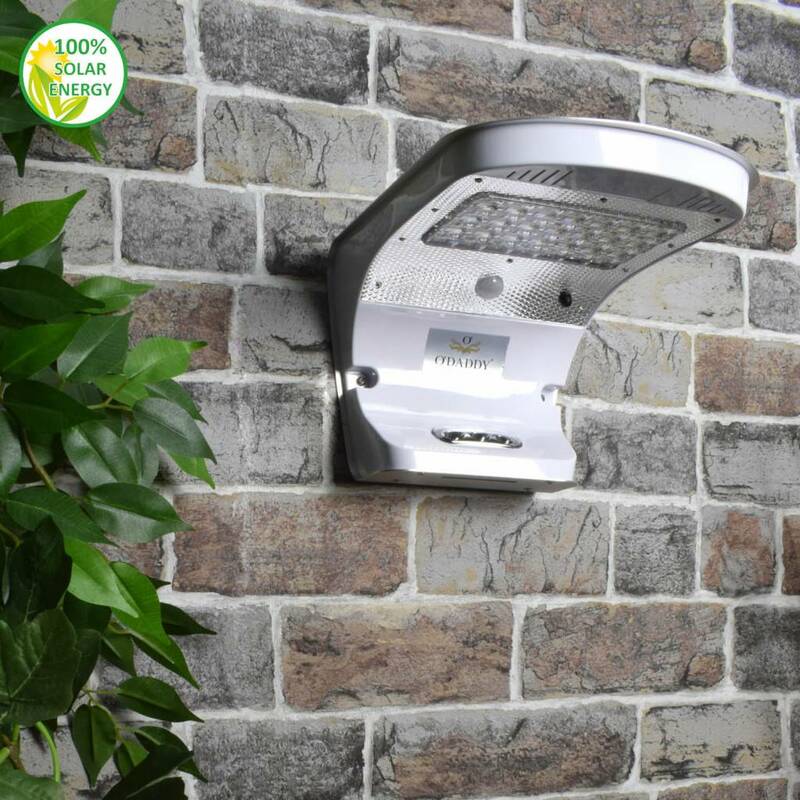 This wall lamp is renewed on a number of areas and now has a light output of 700 Lumens (equivalent to about 70 watts) when motion is detected. In combination with the new large reflecting surface makes this makes a great lamp with a great light distribution. The Galaxy is the most successful model within the lighting range of O'DADDY. The Galaxy is a wall lamp with motion detector. The Galaxy has a wonderful spread of his enlightenment through the renewed reflection plate. In addition, the Galaxy has a motion detector. If anyone walks within a radius of about 3 meters past the Galaxy, it will go to its maximum level of approx. 1000 lumens (comparable to approx. 100 watts) for 30 seconds. Stand A: The light will burn at approx. 5% light intensity. 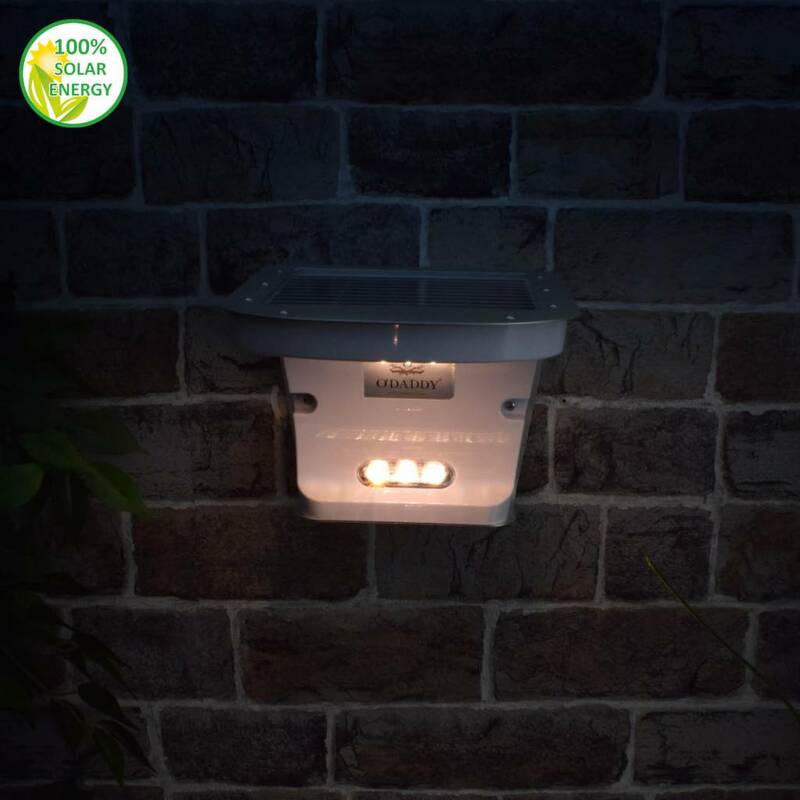 When motion is detected, the light will burn at 100% light intensity for approx. 30 seconds. Stand B: The light will burn at approx. 15% light intensity. 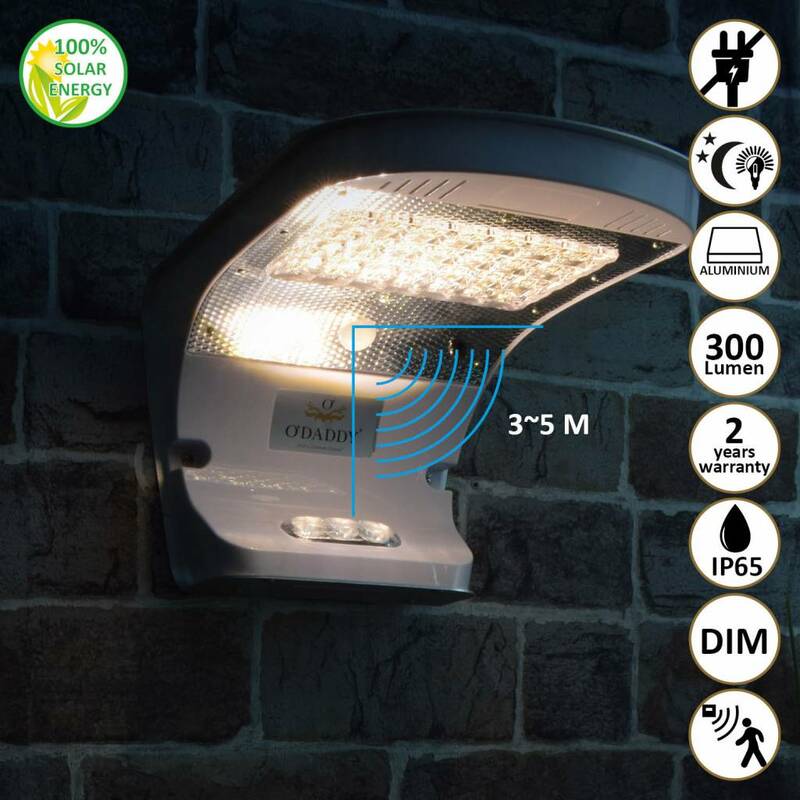 When motion is detected, the light will burn at 100% light intensity for approx. 30 seconds. Warm white (Dim, approx. 3000K) and white (maximum, approx. 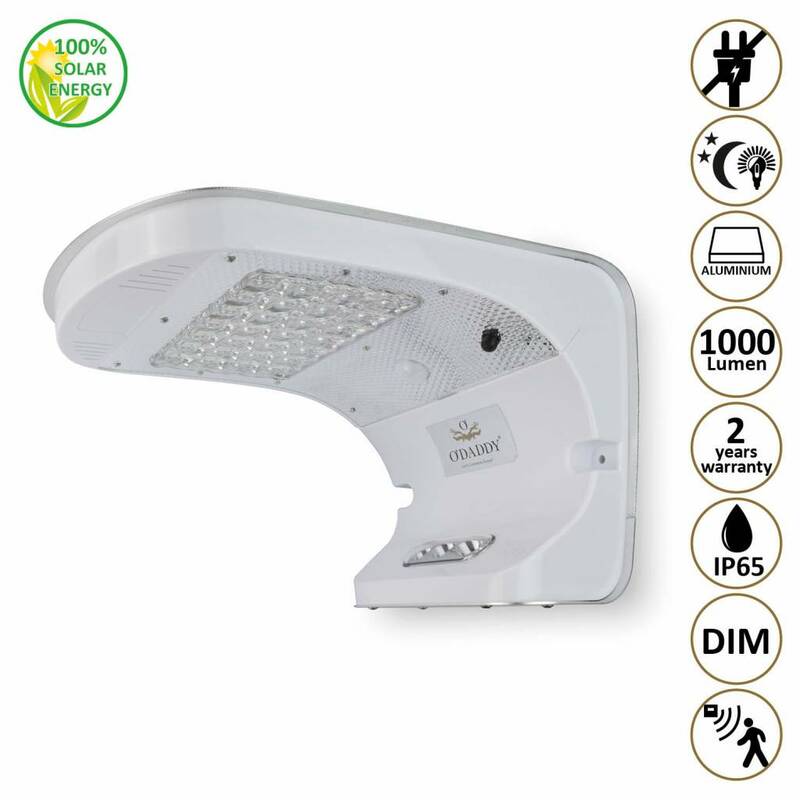 6500K) LED lighting. Material, high quality aluminum with ABS and PVC. 28 + 3 super bright LED’s, approx. 1000 Lumens (similar to about 100 Watt light output). 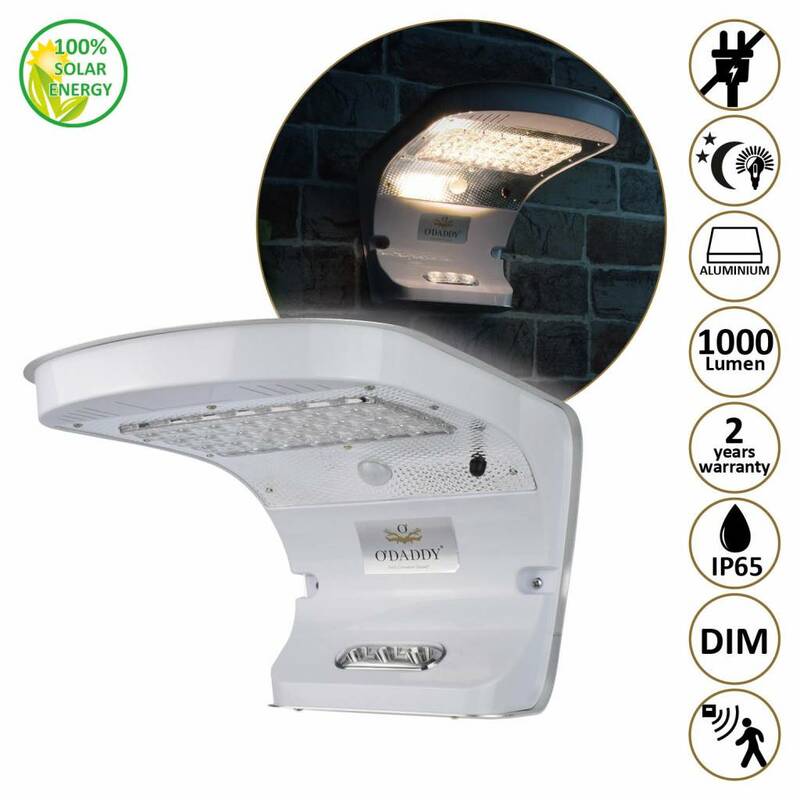 motion senor (white LED lighting) approx. 1000 Lumens for approx. 30 seconds. 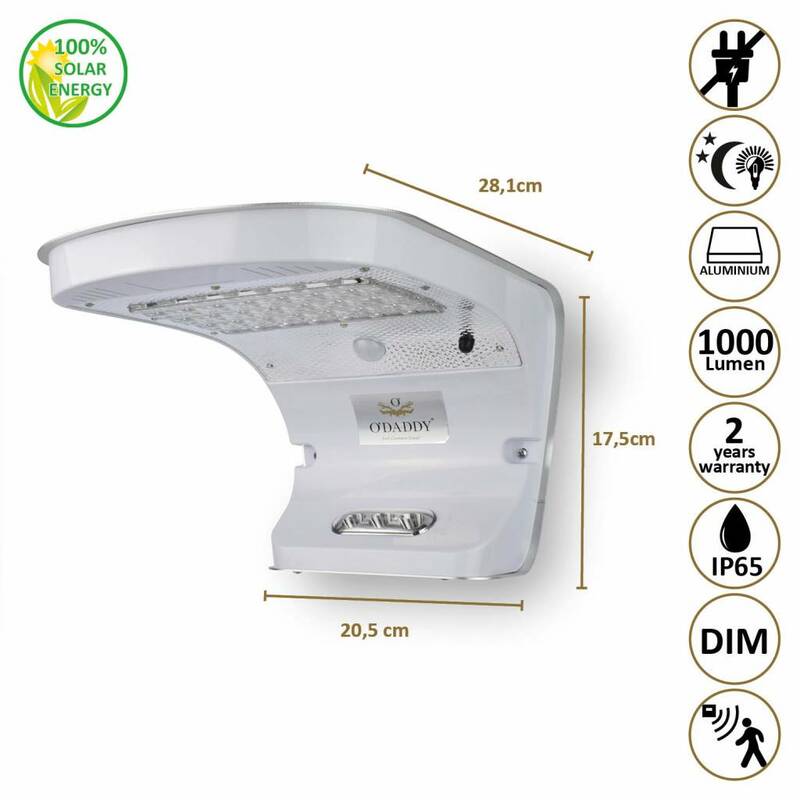 Large solar panel, solar panel 3 Watt. High power battery, rechargeable lithium-ion 4000 mAh. This wall light work differently than the other garden lights. The Galaxy has a built-in motion detector. This motion detector preserves one part of the battery for its account. To this end, the Galaxy has a built-in limiter in the battery. This ensures that the battery Galaxy must retain a certain percentage. When the lamp is charged, but is still subject to the provisions of its capacity, it will not burn. 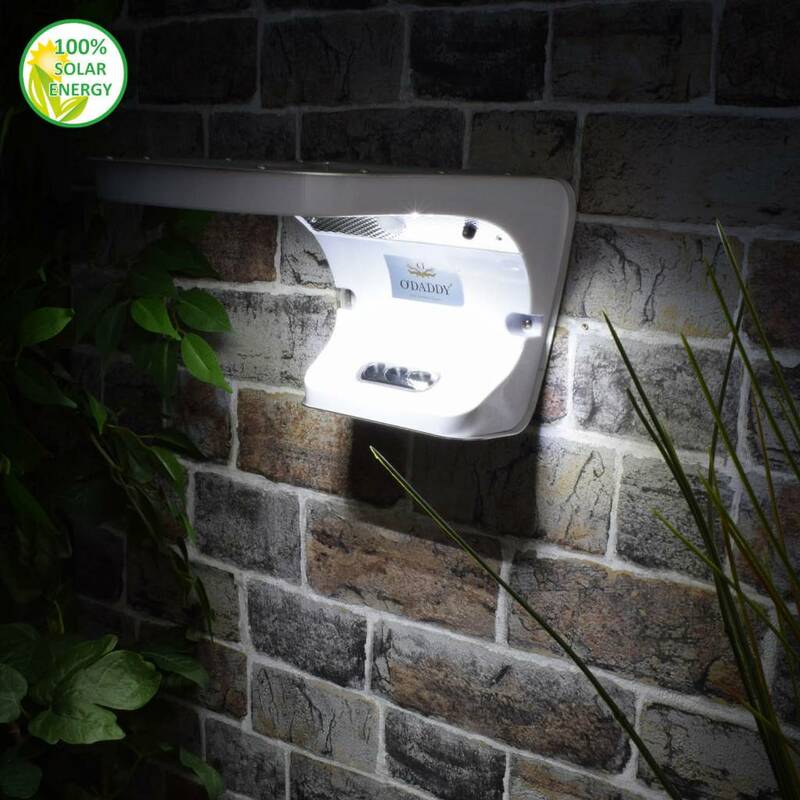 It is therefore possible that the wall lamp will skip a night because the battery has not been able to save enough percentage. The lamp is not defective, if the lamp has built sufficient capacity in its battery will burn again. All this is highly dependent on where the lamp is hung up and the amount of (direct) sunlight. Mounting position is very important. 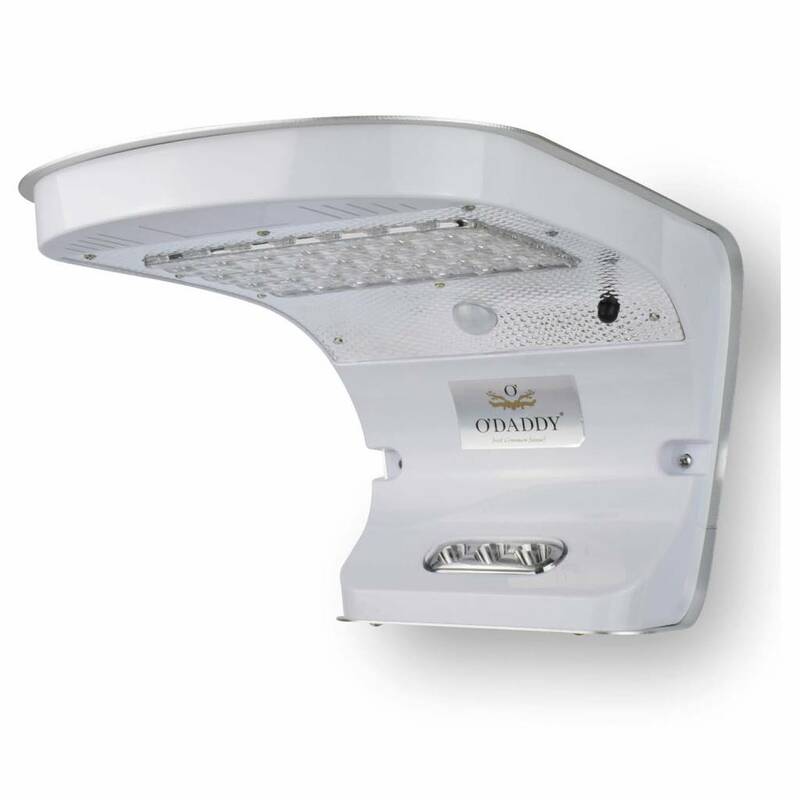 Also the season in involved, in the summer will be less rapidly empty the wall lamp battery for example in winter. Also works in the winter at a minimum temperature of 10 degrees Celsius, however, if the solar panel is covered by snow or ice, the operation will be less to not at all. There is a protective film on the reflection plate, please remove before use. 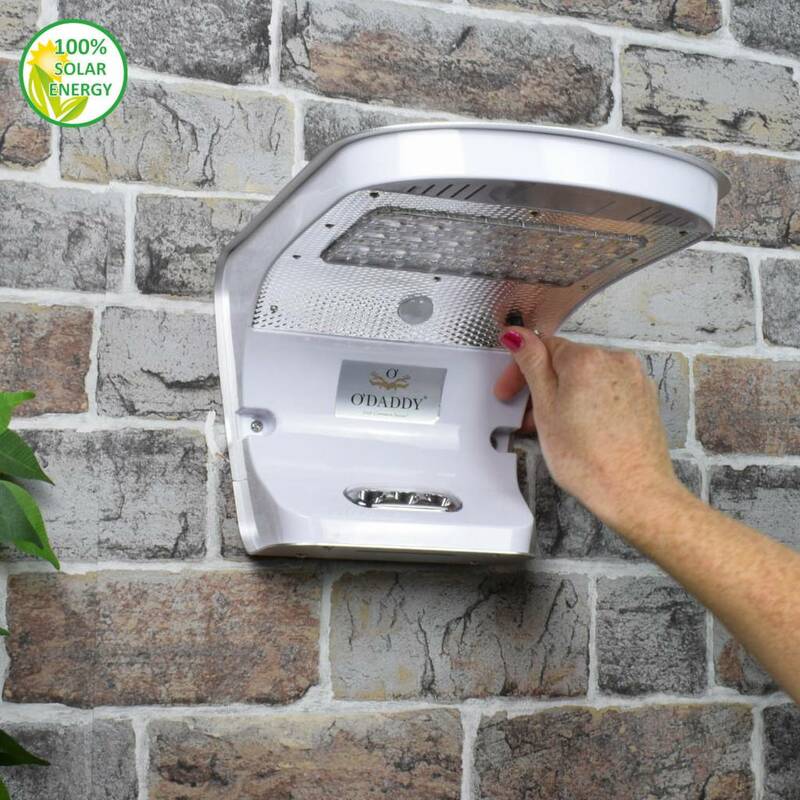 For an optimal operation of the solar panel, you need to clean this regularly with a damp cloth (only use water).